CSAF is all about the Cats! But, the Cats have wonderful human carers that they think you should know more about! Read our stories and find out more about the amazing people who strive to make the Sanctuary a wonderful place​! The joy a Cat can bring to your life! Rapti conducting the interview. 1. What made you come to Malta? 2. What made you come to the Csaf Sanctuary? 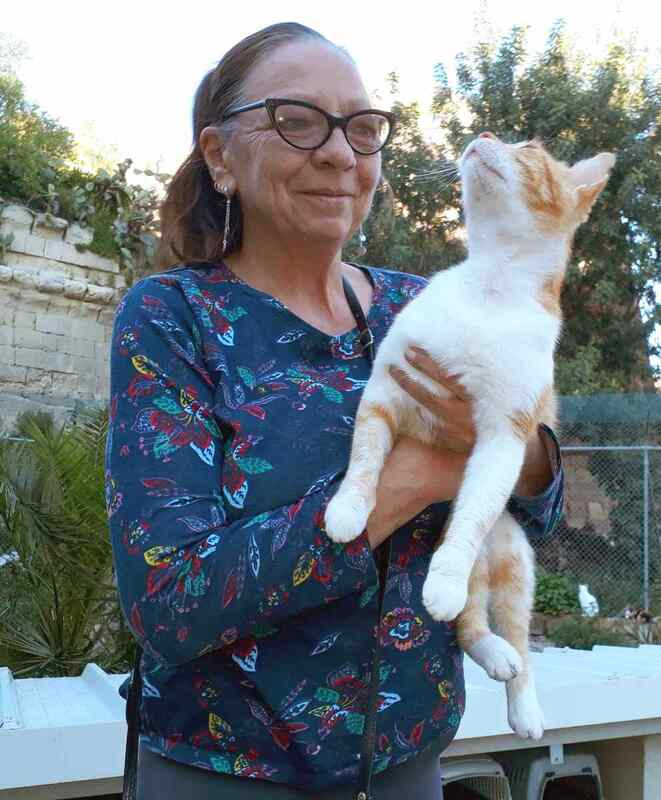 I came to the Sanctuary because a Csaf carer helped me save a stray cat named Nails. He became my best friend and l wanted to help other people to understand what joy a cat can bring to your life. 3. How long do you plan to stay in Malta? I will spend the rest of my life in Malta. 4. What are you career plans? I intend to spend my time doing my art work and hope to open my studio to run classes to share my techniques. 5. Which aspects of your work do you enjoy? 6. Do you have a favourite Cat? I have made friend's with lots of Cats, but I do love Star and Sid . Big thanks to the lady that homed Gipsy and Tinker and to the family that gave Emerald a home. .
Who's in heaven here? Cats or Carer? 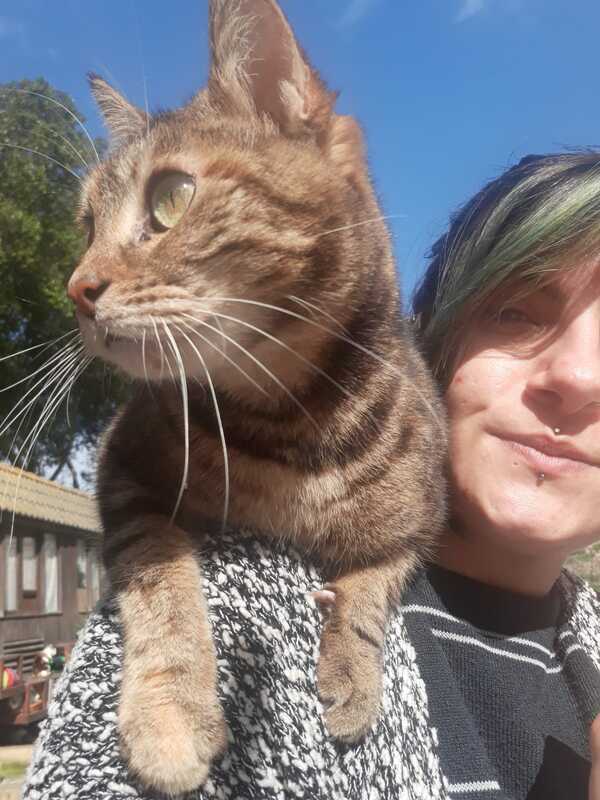 1) How long have you been helping Cats at the CsafSanctuary? 2) Was this your first experience with animals in need? drawn towards helping animal organisations especially feline ones. 3) What made you choose Cats? 4) What was your first experience at the Sanctuary? Petra who made me feel at home. 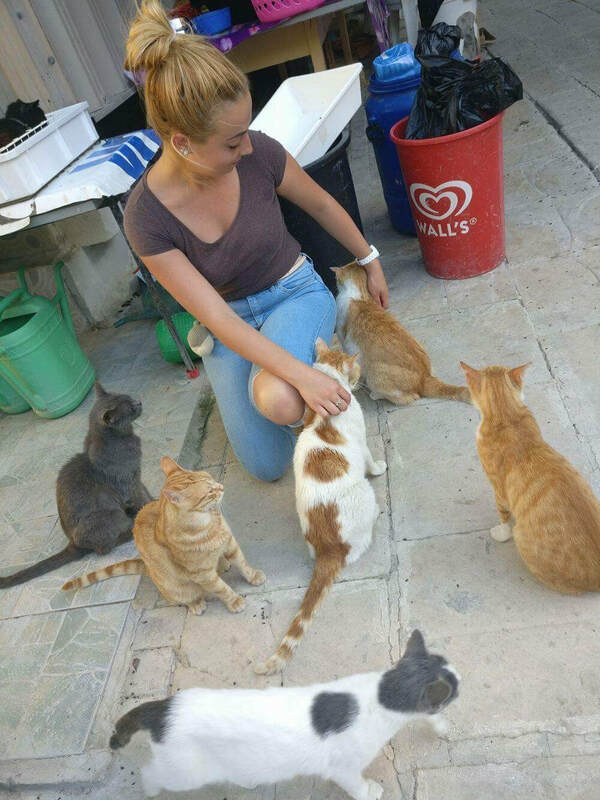 4) Do you have a favourite Cat at the Sanctuary? tuna and lying in the sun. He’s also very good at hiding! 5) Did you adopt any Cats from the Sanctuary? are such loving creatures, for those who appreciate. Sheriff proudly presents his interview with Yanika. He may be losing his sight, but NOT his touch!!! I was born in Malta and lived here all my life. I visited CSAF because I adore Cats and had spare time to volunteer. I noticed the great need for volunteers and kept coming. I need to finish studying at university before I can consider leaving Malta, so I'm staying here for now. I don't have a set career I want to go for, but I'm studying for and MSc. in Cognitive Science so I would like to do something research based. Otherwise I really like HR. 5. Has Malta - so far - met your expectations? N/A since I was born here and don't really have expectations haha. 6. Which aspects of your work do you enjoy? At CSAF I love getting to snuggle Cats and give them affection between mealtimes. Seeing a cat rush to the Gat to greet me or jumping on my lap as soon as I am close enough makes me feel like I've done something good enough to have the privilege of a Cat's trust. It's great and very rewarding to see Cats grow to like and trust me or grow tame because I'm taking the time to give them attention. 7. Do you have a favourite Cat? I adopted one of my favourite cats! His name is Pumpkin. My other favourite cat is Biscuit! 1) How long have you been helping Cats at the Csaf Sanctuary? I started helping at the sanctuary around 4 years ago. Ever since I was young I have always loved animals and I always gravitated towards injured animals. 3) Which other animals did you care for? From a young age people used to bring me sparrows that fall out of the nest to nurse them. 4) How successful were you in saving such tiny fledglings? Most of the time I wasn't successful, but there were times when I was. I had one particular sparrow which I had named Dodo that lived a full life. 5) How did you start with Csaf? I had also been very active in the volunteering scene since I was 18, so at the time I was not volunteering anywhere, I decided to start helping at an animal shelter. 6) What made you choose Cats? The Sanctuary was conveniently located near where I worked at the time , so that was a bonus. 7) What happened when you changed jobs? Obviously I stayed because I now feel that the Cats are part of my life. It s harder with my new job because I work longer hours, but I still try and make it a point to keep my days at the Sanctuary. 8) Do you have a favourite Cat? I should say I have more than one favourite Cat.... but I'm going to name three. I have Mina which is a blind calico Cat, Buddy or better known as Rabti which is a ginger and white Cat and another Cat which lately has grown really attached to me, which I call Lemon. He s another ginger and white fluffy Cat. 1) What made you come to Malta? ​I am a native of Malta. 2) What made you come to the CSAF sanctuary? As I am retired and love all animals the CSAF sanctuary suited my purpose which is to do something worthwhile with my free time. 3) Which aspects of your work do you enjoy? ​I enjoy interacting with all the cats especially the ones that need more attention as they are sick and it gives me pleasure to make them comfortable and show them love. 4) Do you have a favourite cat? I have no favourite cat as I love them all. They all have their particular characteristics and they make me laugh.. I came here for my post graduation in MBA (Master's in Business Administration). I was looking for a part time job and luckely I found this job, which I Love to do and this job is stress relief for me. 3) How long do you plan to stay in Malta? My course period is 2 years and I have three years visa ,so i am gonna stay here for 3 years. 4) what are your career plans? After completion of my post graduation I would like to work for the company for career experience and then I would like to start my own business. 5) Has Malta so far met your expectations? Malta is a very beautiful place and lovely people, until now I enjoyed my stay in Malta and I hope the same in future. 6) which aspects of your work do you enjoy? At my job my work is cleaning, feeding , giving water and dry food and making hot water bottles for cats and I love feeding the cats. 7) Do you have a favourite cat? I love four Cats which stay with me while I make hot water in the cabin and the most lovely Cat is Mamatinna. She is the Princess. I love the island and made friends and then got married here. To adopt a cat. This was 2 years ago. Now I come to help because I felt the need to do some service to help others once a week. I guess I like to be of service of a good cause that needs lots of help. They are all so cute.. can't choose one. 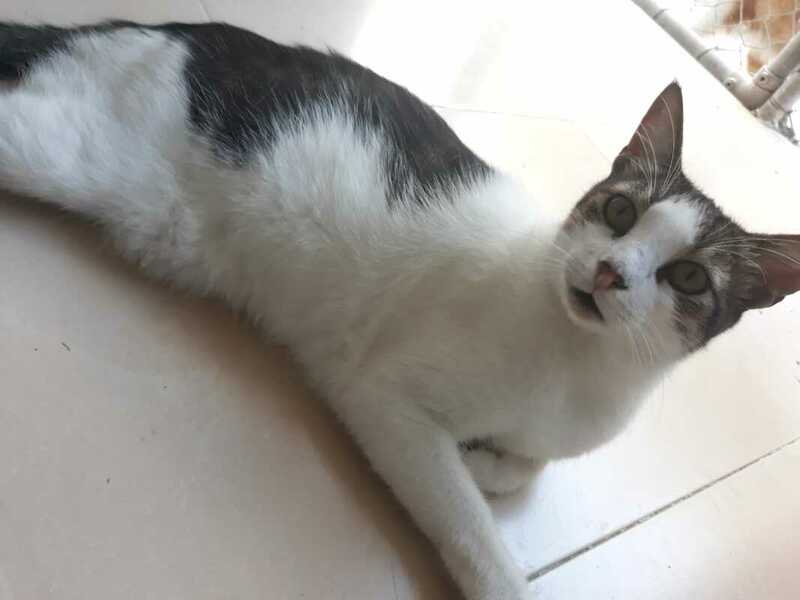 The interview was conducted by Mishou (http://www.csafcatsanctuary.org/cats-for-adoption.html), who likes to keep busy while waiting for his special human. ​Big attraction in the Second Enclosure. Cats observe their Carer at leisure. It is a well known fact that the majority of Csaf Cats love visitors. The entertaiment, the interest, the attention they provide are welcome changes from their daily routine. So Thursday 12 April proved to be a big red letter day! who just did everything right. They discussed possible tasks in detail in advance. They fixed a mutually convenient date and time frame. They even came the night before to acquaint themselves with the tasks in hand (How many tins of cat food would you need for 300 cats???). They arrived on time relaxed, active and happy to be of service.. They organized themselves and the tasks between them independently and efficiently. They negotiated their activities with the carers on site in Maltese, Italian and English. They gave the Cats lots of attention!! They worked hard and well and EVERYBODY had a good time. Cats and carers are looking forward to their next visit in a month's time!!! We were thrilled to have so many committed volunteers help us yesterday- Sunday 13th August! So many jobs got done, so much fun was had by humans and Cats and wonderful new shading erected. Team Work always makes jobs seem easier and brings so much fun and reward to all. Would you come and join our dedicated, friendly team, meet the cats and have a fulfilling time with us? Do you volunteer with us? Would you like to share your story with us? Fill in the form below and we'll be in touch!